If pasilla chiles aren’t on your horizon, you can do the same preparation with ancho chiles, though the flavor won’t be as deep and sonorous. Roasting asparagus (a 400-degree oven is ideal in my opinion) is an alternative to grilling. And replacing olive oil with butter, while not an approach that traditional cooks would likely take, offers an amazing and unexpected flavor. In a medium (3-quart) saucepan over medium heat, warm the olive oil, then add the onion and cook, stirring frequently, until very soft and richly golden, about 8 minutes. Add the garlic and cook, stirring nearly constantly, for a minute or so, until soft and very aromatic. While the onion is cooking, use a pair of kitchen scissors (or a sharp knife) to cut the pasilla chiles crosswise into thin strips no wider than about ¼ inch. When the onion-garlic mixture is ready, use a slotted spoon to scoop half of it into a blender jar, the other half into a small bowl—leaving behind as much oil as possible. Add more oil to the pan if necessary to coat the bottom nicely and return to medium heat. 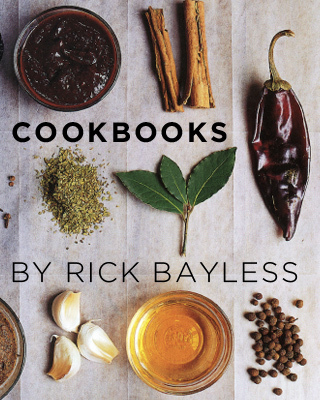 Add the chile strips and cook, stirring non-stop, until the chiles have changed color (the interior will lighten noticeably) and they have filled your kitchen with their distinctive toasty aroma. Too much toasting will yield bitterness in the sauce; too little toasting won’t allow these chiles to give all they have. Scoop half the toasted chiles into the blender, the other half on top of the onions. Add the crema or crème fraiche to the blender and blend until completely smooth—this will take a minute or two. Scrape your pasilla crema back into the saucepan, stir in about 1 tablespoon water to give it an easily spoonable consistency, taste and season with salt, usually about ¼ teaspoon. To the onion mixture in the bowl, stir in the vinegar, taste and season with a sprinkling of salt. When you’re ready to serve, heat a gas grill (or grill pan) to medium or light a charcoal fire and let it burn until medium hot. Trim the bottom of the asparagus: you can cut off the woody ends with a knife, but my stand method is to hold each spear firmly between my two hands and gently bend it until it snaps, which will be exactly at the point where the asparagus starts being really tender; I save the bottoms to blend into soup. 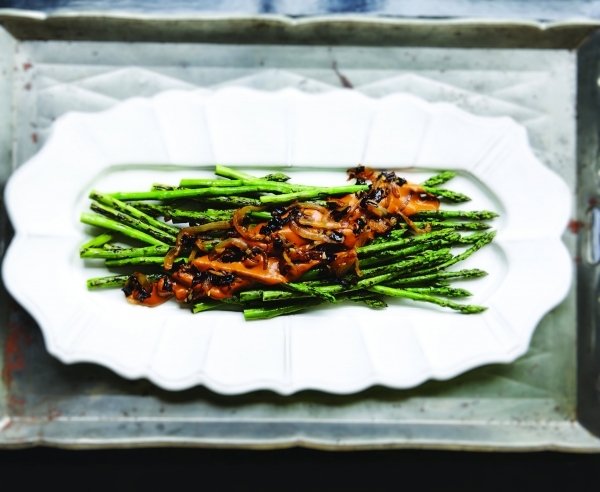 Brush or spray the asparagus tops with oil, sprinkle with salt, and grill, turning regularly, until crisp-tender. Divide the grilled asparagus among 4 plates, warm the sauce a little, spoon it over the asparagus, then sprinkle with the pasilla-onion mixture and you’re ready to serve. My wife and I have watched your show for many years. We live what you do, however we cringe when you salt your food. We realize you ara a restaurant chef, but you add way too much salt! Sorry but it is awful to watch. I think that something that is important to note is how Chefs season food. There is a technique of spreading out your “pinch” of salt and doing sow from high above. This makes it look like a larger amount of salt than it is but it evenly spreads the salt over your product. Also, they often use kosher salt, which has much larger grains than table salt. You need 1.5-2 times the kosher salt to match a volume of table salt. I am a big fan of your show and your cuisine. I have made your receipts many times. I trip to your restaurants in Mexico and Chicago are on my bucket list. The creamy pasilla chile sauce is so good. Just the right amount of heat and smoky/toasty flavors. First time using crema and found it nothing like sour cream. More like heavy cream, wonderful texture and taste. Don’t think I would substitute with sour cream in this recipe. Will be using the sauce on other grilled veggies this summer since summer veggies sometimes lack flavor. I just made this and loved it. However, I found that the toasted chili strips weren’t very edible, when mixed with the caramelized onions. They were fine when blended into the sauce. My chiles seemed fresh….